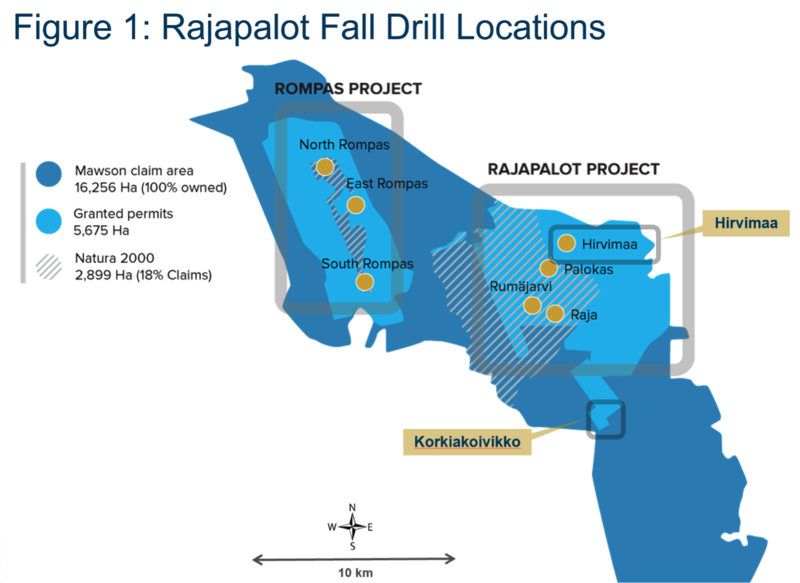 Vancouver, Canada – Mawson Resources Limited (“Mawson”) or (the “Company”) (TSX:MAW) (Frankfurt:MXR) (PINKSHEETS: MWSNF) is pleased to announce the start of the Company’s Q4 diamond drilling program at the 100% owned Rompas-Rajapalot gold-cobalt project in Finland. Geophysical programs continue at Rajapalot. The 2,500 metre drill program aims to test two prospect areas (Figure 1) with significant geochemical and geophysical anomalism interpreted to lie within the stratigraphic host sequence that includes the Raja and Palokas Au-Co prospects where NI43-101 compliant resource calculations have commenced. New gradient array IP/resistivity data has been utilized to target drill holes, in combination with modelled VTEMplus anomalies and BOT geochemical results. Multi-point anomalies in the BOT data provide a strong indication of bedrock mineralization under the shallow till cover (averaging <5 metres thickness). Complex IP responses that include “negative IP effects” combined with VTEMplus electromagnetic conductorssupport drill targeting for this program.Coincident reverse magnetic polarity, conductive and IP anomalism have been previously used to successfully locate gold mineralization. Up to two holes will test a strong VTEMplus electromagnetic conductor associated with a nearby IP response and two gold-bearing boulders (assaying 8.7 and 8.8 g/t gold) at Korkiakoivikko. The Hirvimaa prospect will be tested with up to 10 holes. In other news, geophysical programs are ongoing at the Hirvimaa, Raja, Rumajärvi and Palokas prospect areas that include downhole electromagnetics (“EM”), fixed-loop EM, mise-a-la-masse and induced polarization methods. These geophysical surveys are designed to discover new mineralized bodies and the extensions to known gold. Mawson Resources Limited is an exploration and development company. Mawson has distinguished itself as a leading Nordic Arctic exploration company with a focus on the flagship Rompas-Rajapalot gold cobalt project in Finland. MK Core Drilling of Ranua, Finland will be conducting the diamond drilling producing oriented NQ diameter (46.7 mm) core. This news release contains forward-looking statements or forward-looking information within the meaning of applicable securities laws (collectively, "forward-looking statements"). All statements herein, other than statements of historical fact, are forward-looking statements. Although Mawson believes that such statements are reasonable, it can give no assurance that such expectations will prove to be correct. Forward-looking statements are typically identified by words such as: believe, expect, anticipate, intend, estimate, postulate, and similar expressions, or are those, which, by their nature, refer to future events. Mawson cautions investors that any forward-looking statements are not guarantees of future results or performance, and that actual results may differ materially from those in forward-looking statements as a result of various factors, including, but not limited to, the receipt of disinterested shareholder and Exchange approval with respect to the extension of the Warrants, capital and other costs varying significantly from estimates, changes in world metal markets, changes in equity markets, planned drill programs and results varying from expectations, delays in obtaining results, equipment failure, unexpected geological conditions, local community relations, dealings with non-governmental organizations, delays in operations due to permit grants, environmental and safety risks, and other risks and uncertainties disclosed under the heading "Risk Factors" in Mawson's most recent Annual Information Form filed on www.sedar.com. Any forward-looking statement speaks only as of the date on which it is made and, except as may be required by applicable securities laws, Mawson disclaims any intent or obligation to update any forward-looking statement, whether as a result of new information, future events or results or otherwise.